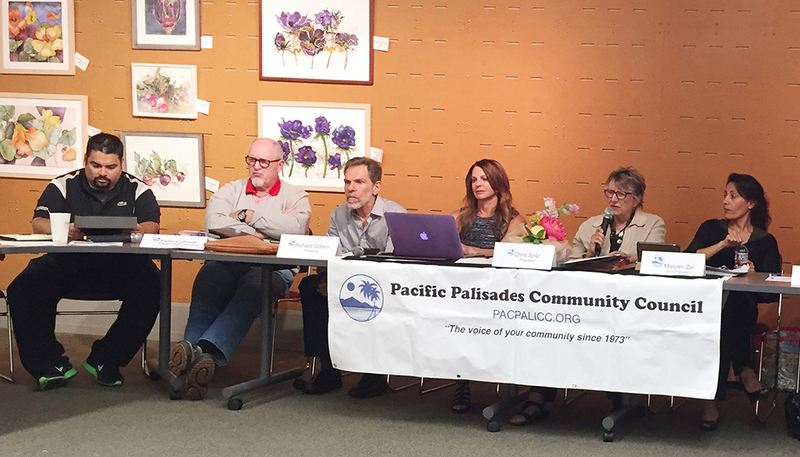 With hugs from Councilman Mike Bonin’s Senior Field Deputy Sharon Shapiro and District Director Debbie Dyner Harris, Chris Spitz served her final meeting as president of the Pacific Palisades Community Council on June 23. Janet Turner, on behalf of Congressman Ted Lieu, also recognized Chris and then thanked Jennifer Malaret, who is retiring after serving as secretary for three PPCC presidents (herself, Barbara Kohn and Spitz). Community Council board members at the June 23 meeting included (left to right) Reza Akof (Area 8—Riviera), Peter Culhane (Area 2—Highlands), Richard Cohen (treasurer), Jennifer Malaret (secretary), Chris Spitz (outgoing president) and Maryam Zar (incoming president). At the beginning of the meeting, Turner warned that some residents had received telephone calls from people purporting to be from the IRS. The resident is told that the IRS is going to sue and the person is told to call a number to get the case number. Another resident said that he called the number back and the person who answered said he was going to be arrested unless he sent money. “This is a scam,” Turner said. “The IRS never contacts people through telephone calls.” She said if a resident gets a call, and can see the call-back number on his/her phone, he or she should go to TIGTA.gov and click on the right column (IRS Impersonation Scam Reporting). There was an update on aircraft noise by Santa Monica Canyon resident Debbie Warfel, who said residents and Bonin had sent letters complaining about the increased noise to Representative Lieu and Senators Diane Feinstein and Barbara Boxer. The FAA has denied that anything had changed. The LAX (Los Angeles World Airport) hired a consultant to do an independent study. It was released on June 8 and the report said nothing had changed. Warfel said the Santa Monica Canyon Civic Association had hired an aviation lawyer and “we’re waiting for a response.” She also noted concerns about possible noise when the NextGen project goes into effect. NextGen will replace radar-based flight monitoring with global positioning satellites. Those who rent out their homes would have to register with the city and collect the same kind of lodging taxes as hotels. Renting out a house or room for more days than the city allows could mean a fine of at least $2,000 a day. Cheryl Zomber, representing Marquez Knolls Property Owners Association, questioned Shapiro and Dyner Harris about the status of a letter that Bonin said he would publish clarifying that not all Palisadians were opposed to the amendments to the BHO. Bonin’s representatives said Tricia Keane was handling it, and Zomber should speak to her. Zomber said Keane had promised to send out a letter a week ago, but had not. She had tried repeatedly to reach Keane, but there had been no response. Zomber told the Council that Marquez Knolls was not represented when a vote was taken by PPCC to oppose the Mansionization Ordinances and that the Community Council did not address MKPOA’s concerns (see pages 6 and 8). No one from Area 3 was present when the motion was made by Reza Akof and passed by PPCC. An audience member questioned whether Akof, a developer and Area 8 Representative, had a conflict of interest in making the motion to allow larger homes. Spitz said, “I don’t need this controversy at this point. I just want to get through this meeting.” She suggested that Zomber address the issue with the new president, Maryam Zar.